Whether you're cooking pork chops, a pork roast or pork loin, a meat thermometer is the safest and most effective way to tell if the meat is done. Other checks for doneness exist, and many cooks use those methods. But using these methods puts yourself and other diners at risk of becoming sick from dangerous bacteria. You'll know for sure when pork is fully cooked when its temperature reaches 145 degrees Fahrenheit on the thermometer. A meat thermometer, either an instant-read variety or the type that is left inside the meat during the entire cooking time, provides the only accurate way to ensure that pork is completely cooked. Allow the meat to reach 145 F in the oven; then allow it to rest outside the oven, covered with foil, for an additional 3 minutes. 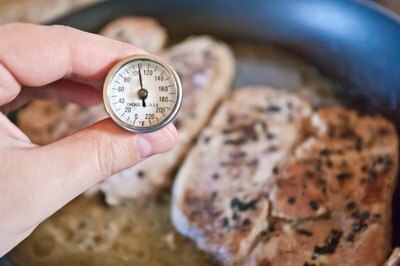 This temperature works for all cuts of pork with the exception of ground pork, which needs to reach 160 F. Place the thermometer in the middle of a roast or medallion or sideways into a thin pork chop or ground pork burger. 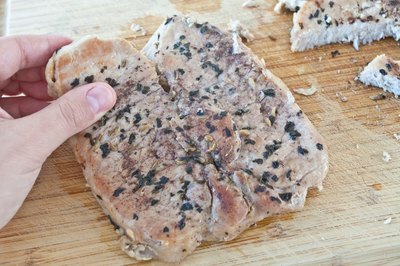 The touch method of testing if pork is done works best for thin cuts such as chops steaks or medallions, but it should be used in conjunction with a meat thermometer. The pork may be done when it feels about as firm as the fleshy part of the palm of your hand under the thumb and when it springs back a bit after you press it. Insert your instant-read meat thermometer at this point to be sure the meat is cooked to 145 F.
Color does not give you an accurate measure about the doneness of pork. 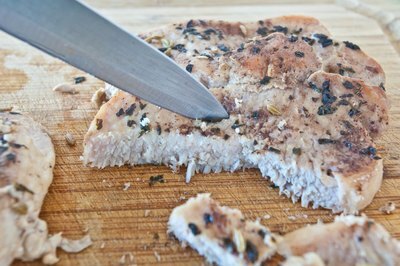 Certain pork cuts, the addition of certain ingredients, or the cooking method may all cause thoroughly cooked pork to look pink. Pork differs from beef in this manner because it contains fewer myoglobin proteins, the substance that cause meat to look red and turn brown when cooked. With less myoglobin, the change in color for pork is less distinct than in beef, according to Dr. Melvin Hunt and Becky Zenger of Kansas State University, writing for the National Pork Board. Like the visual test, the pierce test is not an accurate way to determine whether or not your pork is cooked through. This theory states that when the meat is cooked, the juices will look mostly clear, with just a faint trace of pink when you pierce the flesh of the chop or roast with a fork or the tip of a sharp knife. Not only does this method allow flavorful juice to escape into your pan, but it is very difficult to be sure about the color of the juice.